Air Commodore Raymond asks Biggles, Algy, Ginger and Bertie to help in the hunt for a German submarine, U-517, believed to have a hoard of gold stolen from various allied ships during the war. Now the war is over the ruthless Captain of the U-boat, called Von Schonbeck, plans to keep the gold. Setting up a base at Kerguelen Island down towards the bottom of the Southern Hemisphere, our heroes have to find the Sub and then try to locate and recover the gold. Based in the middle of nowhere, with nothing between them and the South Pole, they are first alerted to the presence of the U-boat when it sinks their supply ship. Whilst trying to depth charge the submarine, Biggles and Ginger are shot down and later taken prisoner. Ginger saves Biggles from a firing squad before they manage to escape. With the help of some Norwegian sailors, the submarine is eventually trapped in its own secret harbour and its crew takes to the island. 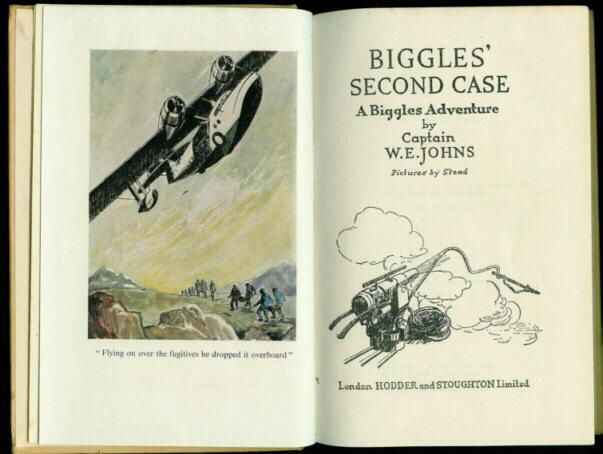 Biggles and his allies have to fight it out with them before Von Schonbeck meets a nasty fate in a bog. The dust cover of the book shows Biggles' seaplane flying over the submarine.